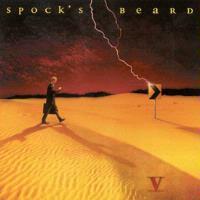 The fifth album from Spock's Beard shows them to be at the forefront of current progressive music. In this album the band is able to play exciting, adventurous music without ever becoming self-indulgent or pompous. Neal Morse continues to excel as a songwriter, and the arrangements are stellar. The band shows its ability to tackle both short pieces as well as lengthy song suites. This disc is destined to stand out as one of the best in the band's career. The band at this time is: Neal Morse, piano, keyboards, and vocals; Ryo Okumoto, Hammond organ and mellotron; Dave Meros, bass, acoustic bass and French Horn; Alan Morse, guitars, cello, and vocals; and Nick D'Virgilio, drums, percussion, and vocals. Also appearing are: Katie Hagen, French horn; Chris Carmichael, violin, viola and cello; Kathy Ann Lord, English Horn; and Joey Pippin, trumpet. Copland-like woodwinds start this song. The band then kicks in to a high-energy verse-chorus structure, but then the piece goes into several different directions: it kicks in, it lays back; there are moments of softness, but then moments of all-out attack. There are some expected parts, such as the jazzy keyboard-drum-upright bass section at 6:18, or some playful moments, such as Alan Morse's "wounded animal" guitar at 7:06. There are parts of the song that require precision playing, and the band never fails to deliver. The band finally finds itself back at the original verse, and Dave Meros shows some funky chops on bass. All in all there are about five different "movements" that could be songs in themselves all tied neatly into one sixteen-plus-minute piece. This is a song that switches between lazy, soft verses and power-chord choruses. Morse sings of a woman who sounds to be, at best, an enigma to him. A rather jazzy Fender Rhodes takes a short solo, but then the band powers up to let Alan Morse show some of his licks. This song was a songwriting collaboration, with Neal Morse, Alan Morse, Nick D'Virgilio, and Ryo Okumoto sharing the credits. Although Morse finds his songwriting "voice" more and more with each album, this track finds the band going back to mid-70s Gentle Giant for inspiration. "Thoughts (Part 2)" comes complete with complex a cappella vocal lines, a snippet of a string quartet arrangement, and thumping heavy metal riffs. Alan Morse also gets a songwriting credit for this. "All On A Sunday" is a fun, light-hearted tune that shows the band can create good music without always having to push the envelope. This cut, dealing with the joys of a lazy Sunday morning (sleeping until noon, zoning in front of the TV), is a rather simple pop song, but with quite an infectious chorus. This number is the most mellow on the album, reminiscent of "Lay It Down" from their last album, Day for Night. Mellotron and synthesizer accompany a nice fingerstyle guitar riff. Like "Lay It Down," this one is a bit introspective, encouraging us to move on in our lives. There is a bit with a French horn taking the lead, and the harmonies, though sparse, are excellent. Possibly the band's crowning moment, this 27-minute symphonic suite is a not-too-veiled indictment of the music industry and how the corporate end interferes with the creative end. Few bands today possess the ability to master such an undertaking, but that shows the uniqueness and talent of Spock's Beard. A voice mellotron starts with a rather strange chord. Other keyboards come in for a Floydian introduction. An acoustic guitar then clearly states a theme, and this theme - an "uber-riff," if you will, appears throughout the entire piece in different guises. The band joins in to repeat this theme (with cello!) before taking off in a different direction, picking up the pace. Neal Morse leads this section, singing the first verse with only piano. The band slowly fills in. This movement lays out the story line. At this point there is only "one note," played without "a buzz or a showing." This starts with the "One Note" melody accompanied by an acoustic guitar. The band then goes into a rather complex instrumental segment that's built around the "uber-riff." Okumoto chews up the scenery with an organ solo during this section while Meros fills in with some remarkable sixteenth note riffing in the background. A bridge then brings the piece down to ground, and the movement ends with the piano playing the main riff accompanied by mellotron. The corporate types contemplate what to do with their protégé in this section of the composition. Meros and D'Virgilio lay down a complex, staccato rhythm over a 6/8 pattern. The pace quickens on this section, and Okumoto's Hammond organ chording powers the song. The melody to this is incredibly catchy, showing that Neal Morse can write some of the catchiest music in the prog world. A quick transition leads into this segment, and the subject of this song begins to see that his big opportunity may have passed him by. This movement also includes a brilliant transition for one more verse with the theme used in "Submerged", but not before Alan Morse gets a short, but precise, solo. After the last verse, where the corporate types decide "it's too late", the "hero" tells himself "Something keeps telling me quiet now…quiet now…", knowing that his time in the spotlight has come to an end. This section is very much a reprise of "From Nothing" and "One Note." A solo acoustic guitar states the theme, and the band responds in a raucous fashion. They build the tension in a Yes-like fashion (with D'Virgilio displaying some incredibly strong, yet lively, drumming), and then the floodgates are let loose for the final verse - Okumoto's Hammond is pushed at full volume, D'Virgilio's drumming powerful enough to carry the rest of band on its shoulders, and the harmony vocals are enough to give goose bumps. The band finishes with a final instrumental section that is one last variation on the uber-riff.. This progression allows Alan Morse to embellish a bit on a double-tracked solo, and this segment resolves into a lengthy finale. Morse plays a repetitive riff while the band floats around it in a major mode, but then shifts to an unsettling minor mode. A simple piano arpeggio in major ties up the song nicely.